Dear reader in our previous post we have discussed about materials required for micropile construction. There we have learnt about cement, admixture, filler and water quality for micropile construction. We will learn about reinforcement in this post. 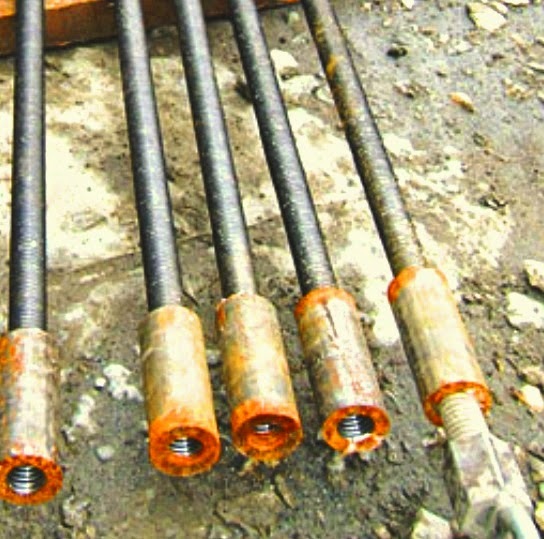 According to International building code steel reinforcement provided in micropile should be designed to bear not less than 40% of compressive stress. Any portion of micropile or micropile as a whole has been grouted in open hole without permanent or temporary casing in soil and where suitable means to verify hole diameter is not available during grouting, the reinforcing steel should be designed to bear total compression loads. We know deep foundation element may suffer tension loading with usual compression load; this is due to lateral forces from various sources and in rare case direct pullout force. Sometimes bars coupler is used in reinforcing bars; they should develop to their ultimate stress without having any sign of failure; here we also discussing about tensile loading. In case of compressive loading, the coupler, where required, should compatible with overall requirements of reinforcement performance and should have efficient and effective load transfer mechanism.